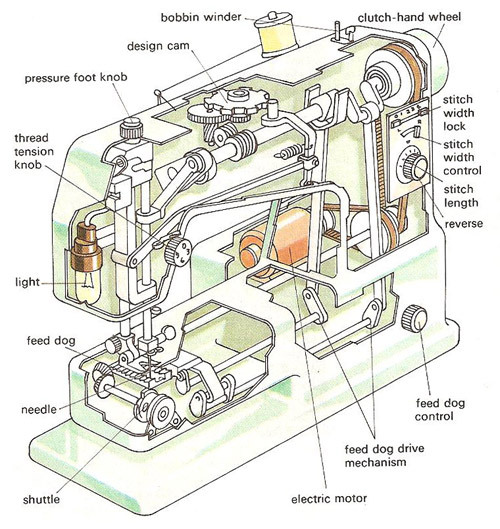 Cutaway of an electrically powered domestic sewing machine using the lock-stitch system. Power is supplied by belt to the main upper shaft which in turn drives the needle bar up and down via a crank. Power is also supplied from the main shaft to the bobbin and rotating hook under the working platform and via cams to the feed dogs which move the material being sewn to across the working platform under the pressure foot. Zigzag stitches are made by swinging the needle bar to and fro at right angles to the path of the material. Variously shaped cams can be loaded into the top of the machine to control the needle bar, rotatory hook, and feed dogs for automatic embroidery and fancy stitches. A sewing machine is a machine for sewing cloth, leather, or books: a major industrial and domestic labor-saving device. There are two main types: chain-stitch machines, using a needle and only one thread, with a stitch that pulls each looped stitch through the next; and lock-stitch machines, using two threads, one through the needle eye and one the other, which interlocks with the first in the material, from a bobbin/shuttle system (to-and-fro and rotatory). Chain-stitch machines – the first to be invented, by Barthélemy Thimmonier (1793–1859) – are now chiefly used for sacks or bags. The lock-stitch machines now in general use are based on that invented by Elias Howe (1846). Zigzag machines differ from ordinary straight-stitch machines in having variously shaped cams that move the needle from side to side.